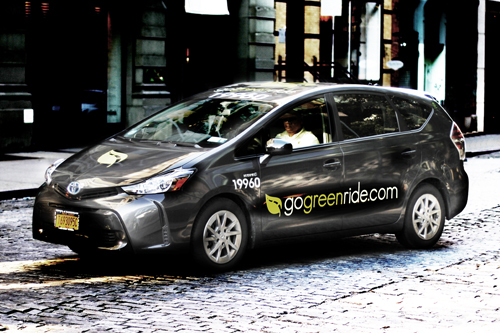 NuRide operates an eco-friendly fleet, which we call GoGreenRide. As a community car service division of the company, it meets the growing demand for energy-efﬁcient, environmentally sustainable transportation alternatives and addresses the need for air quality preservation in New York. This fleet is comprised of carbon-neutral, environmentally friendly, hybrid vehicles and features the Prius V model. Its main targets are corporate clients and individuals, who join our service based on a membership model. Currently, there are more than 20,000 members, including Facebook, Goldman Sachs, Marc Jacobs, Michael Kors, and over 85 hotels. Our eco-friendly division provides its clients with in-car iPad tablets, charging stations, free WiFi, and in-car entertainment. Because they have so much at their fingertips, all of which are not available in the average car service's vehicles, customers are delighted and happily spread the word to others. These advantages help distinguish our eco-friendly fleet from the pack, while creating lasting relationships and partnerships. 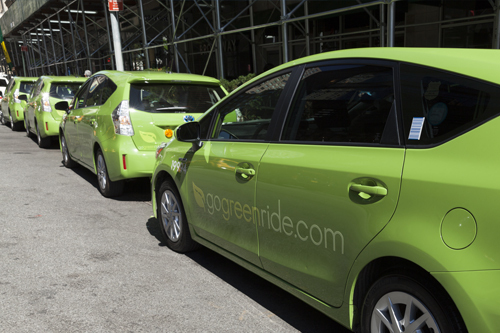 GoGreenRide is a membership-based transportation service that's easy and free to join. Once a member, users are able to book rides for immediate service or in advance. GoGreenRide's members appreciate both the eco-friendly service, as well as the access to the individual charging stations, tablet, and in-car WiFi. This combination of cutting edge, new-age provisions are what set GoGreenRide apart from any other fleet.